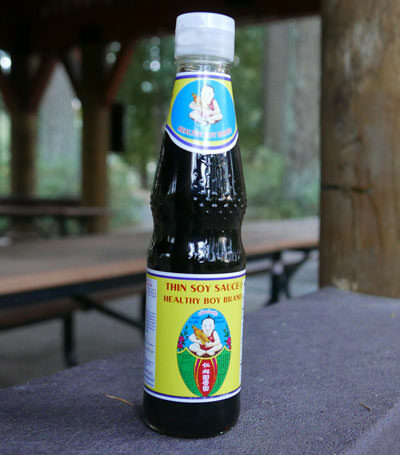 A light, thin soy sauce made using a natural fermentation method. The most famous brand and widely used soy sauce in Thailand. Superior quality from Healthy Boy, since 1947. Our Thai customers living in United States are very glad that their favorite soy sauce is now just a few mouse clicks away. Sprinkle a few drops over all Thai dishes for great flavor, and rest assured this is a premium product made using the natural fermentation method in a modern facility with ISO9002 certificate. Please see our feature story on how soy sauce is made. Saveur Magazine recommends ImportFood.com for Healthy Boy soy sauce. Ingredients: soy bean, wheat, salt, sugar, msg, preservatives 0.1%, artificial color. Special Offer: 4 Pack. You get 1 bottle each: thin soy, sweet soy, dark thick, and yellow bean sauce. One of the more popular dishes on the menu in Thai restaurants in America but also Thailand. This recipe is time-consuming but the result is spot-on perfect. The finest cashews in the world are grown in Thailand, mainly on the island of Phuket. Mamuang himaphan means cashew nut but there is an interesting translation. Himaphan's original meaning refers to the Garden of Eden, and the cashew nut looks like a small mango. The resulting pun can mean "mango of paradise", suggesting culinary heaven. We use regular refined white sugar for simplicity but you may use palm sugarfor a more succulent flavor. This is a simple recipe using just a few ingredients that we made at home using an electric griddle. It can be made in a skillet or in a barbecue, it really doesn't matter. This recipe came to us from an office worker in Thailand who enjoys making satay. We find that it's difficult to enjoy true vegetarian Thai food because so many recipes use fish sauce; however, we absolutely love this vegetarian larb recipe. It does take time to prepare but the result is both nutritious and delicious. Vegetarian or not, you'll love this elegant recipe too. We also have a non-vegetarian recipe for larb woonsen. Pork satay consists of strips of marinated pork on bamboo skewers, charcoal barbequed then served with a tasty peanut sauce and a white vinegar cucumber sauce. It's often served in Thailand with squares of toast, as shown in our recipe here. We made pork satay in the true authentic Thai style, which is time-consuming. Be sure to baste your satay as it's on the barbeque, note from our street vendor video (below left) he is constantly basting. It seems that most of the time, this style of satay is made with pork, but you can also find chicken satay and prawn satay. We offer a ready-made satay mix that's quite good for both chicken and pork. Recently we had a fantastic meal using this recipe, prepared with our high-fat Chaokoh coconut cream rather than coconut milk, and we omitted the peanuts altogether which led to a very rich, slightly spicy satay full of true Thai flavors (see pictures below right). There are four different things you need to make: marinade, basting sauce, satay sauce, and ajad. This is a popular "snack", but it can form a course in Thai style dinner. It could be made from any fairly fatty cut of pork, but is normally made from the hocks and shanks of pork. Teriyaki is only one flavor in Japan but it's become very popular in America, and we believe you'll like this recipe. The mirin is an essential ingredient that brings out flavor and creates the shine of the sauce. Gyoza is originally a Chinese dish, which has become very popular across Japan. This recipe shows how to make the gyoza dough , filling, and walks you though the cooking process with descriptive photographs. Makes 30 gyoza.